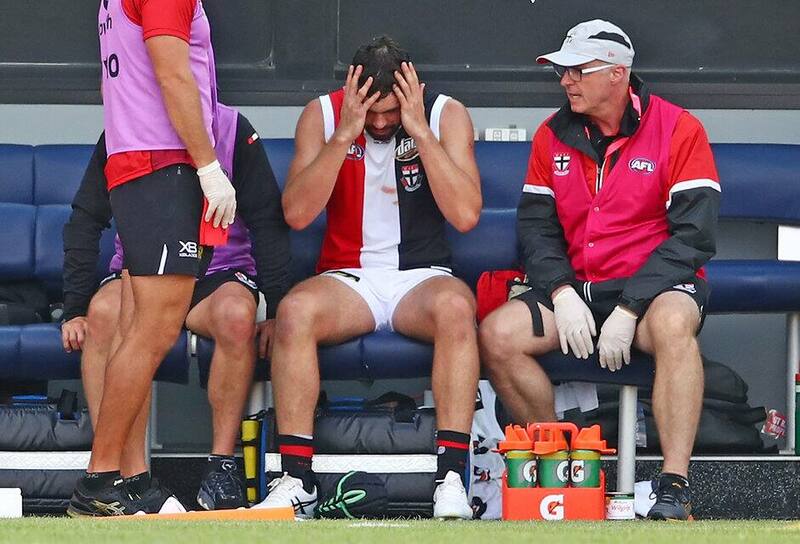 ST KILDA forward Paddy McCartin will undergo further tests this week as the Saints attempt to determine the full extent of his latest concussion blow. AFL.com.au understands Saints medicos will work closely with neurology experts to monitor McCartin's screenings, with results due in the coming days. The 22-year-old suffered his eighth concussion since 2015 in the Saints' final JLT Series hitout last Sunday before spending the night in hospital. While McCartin has undergone initial testing, it is understood the findings over the next week will provide a clearer course of action for his immediate football future. It ensures the former No.1 pick will be ruled out of Sunday's season opener against Gold Coast at Marvel Stadium with no definitive timeline for his return in place. McCartin last year sat out three matches following a concussion sustained in round seven before opting for a helmet that he has worn since. McCartin's concerns come after defender Dylan Roberton last week revealed to the Saints' playing group he was sitting out of football for 2019 after his latest heart scare.